Republican reaction to Minority Leader Chuck Schumer's proposal to rename the Russell Senate Office Building for John McCain was mixed, even as Sen. Jeff Flake, R-Ariz., signed on as a co-sponsor. "I'd like to put together an official group that can collaborate and bring together ideas from current members, former colleagues and friends," McConnell said on the Senate floor. "It will be bipartisan — as only befits John's legacy. And come to think of it, we should probably call it not a committee, but a 'gang.' So I'm glad we'll be able to form this gang to ensure that a suitable, lasting tribute becomes a reality." Schumer announced his suggestion shortly after McCain died. He said the proposal would honor McCain while also removing the name of former Sen. Richard Russell, D-Ga., who had an anti-civil-rights record during his tenure in the Senate. "The man whose name he would replace, Sen. Richard Russell, a towering figure in the Senate of his day, was an avowed opponent of civil rights and the architect of the Southern filibuster, which long delayed its passage," Schumer said Monday. "It's time that we recognize that as times change, so do our heroes." The idea gained national coverage in the days following the announcement, but many Republican lawmakers hesitated to endorse it. Georgia Republican Sen. David Perdue told reporters that Schumer jumping forward to offer one suggestion could be viewed as a political play. "I think we need to take a deep breath and do these ceremonies this week in a manner that will respect his legacy and his life," Perdue said. "Then I think we need to take a deep breath and find the right way to honor him publicly and permanently. Rushing to judgment and making it political or whatever is not the appropriate thing." Perdue's Georgia colleague, Sen. Johnny Isakson, refused to discuss the possibility of renaming the building, saying he did not want to inject politics into a week meant to honor McCain. Others, like Sen. Susan Collins, R-Maine, said Schumer didn't discuss the idea with other senators before making the announcement. "It's my understanding that Sen. Schumer announced it without even talking to a single Republican," Collins said. "I think a better approach, especially since we're honoring the legacy of someone who believes in bipartisanship, is for the two leaders to get together and decide if this is the best way to honor him or is there another way that might be more appropriate." Schumer continued to push his proposal, saying on the Senate floor Tuesday that he was circulating a letter to colleagues urging them to join the effort. 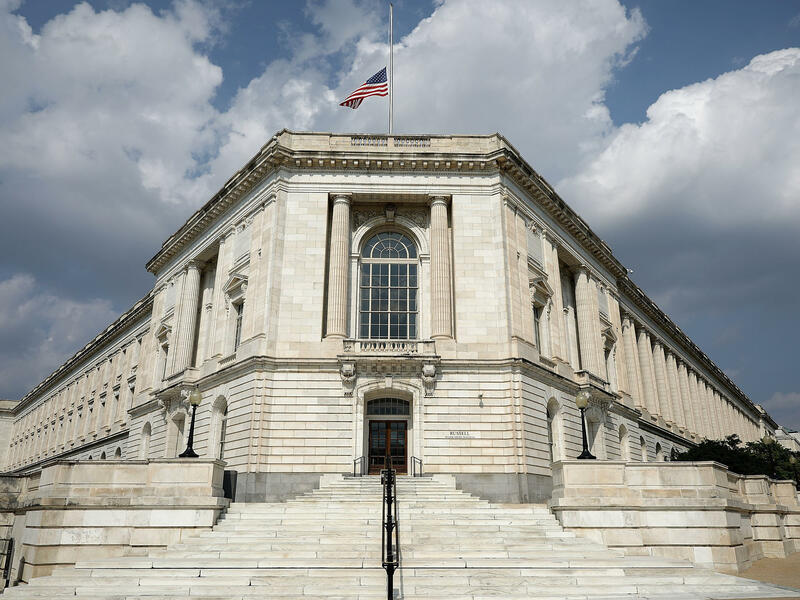 While McConnell avoided directly addressing the idea of replacing Russell's name with McCain's on the Senate office building, his move to take a pause to discuss several ideas effectively stalled the effort.